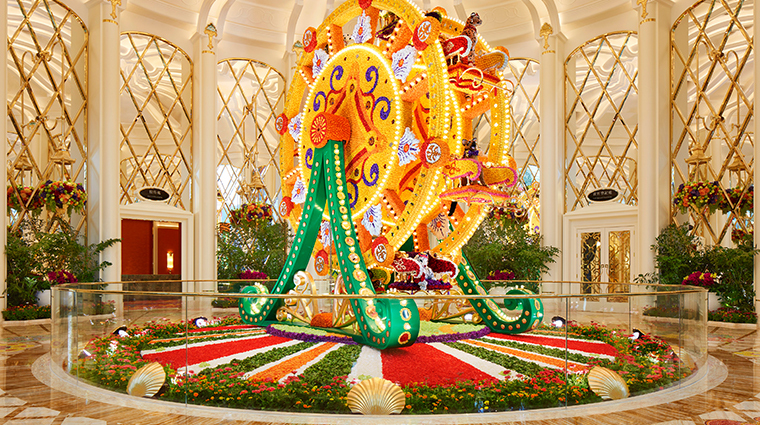 Hotelier Steve Wynn brings his fantastical style to the Cotai Strip in Macau with Wynn Palace. The appropriately named hotel makes you feel like royalty — from the extra-wide corridors, high ceilings and mirrored walls to an incredible art collection and imaginative culinary experiences. Inspired by flowers, the design pays tribute to petals of all shapes and sizes. 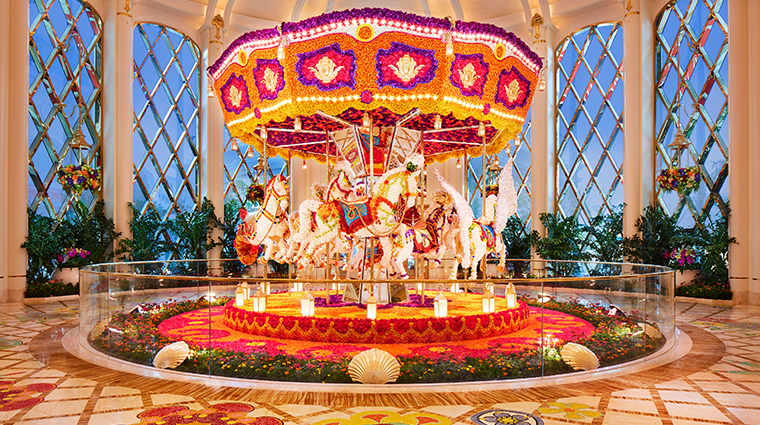 Look for details in the wallpaper and carpets, as well as elaborate floral displays — all designed by Steve Wynn and New York City-based talent Preston Bailey. When it comes to entertainment, the star of the show is the eight-acre Performance Lake, which springs to life every 20 to 30 minutes. 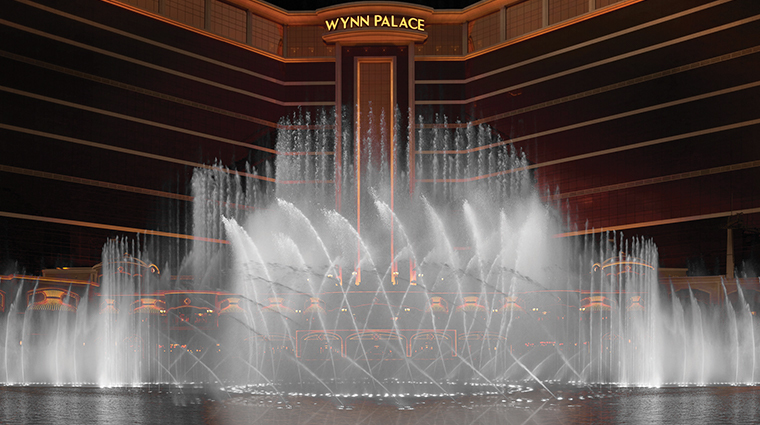 Best viewed at night, the choreographed light and water show features 5,505 multi-colored beams that shoot into the sky for an elaborate display. 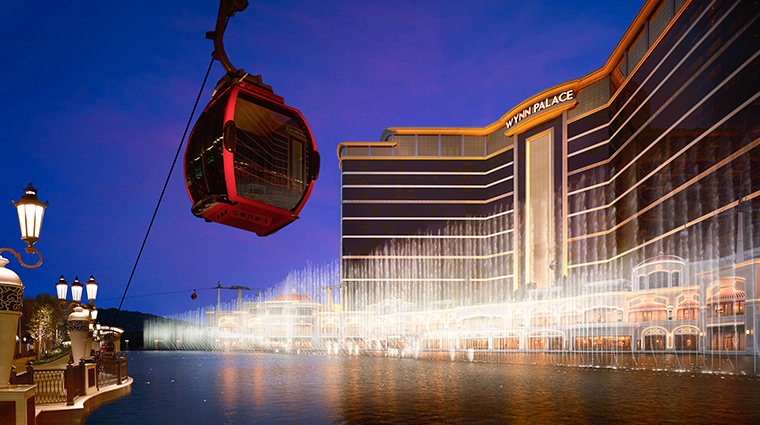 Adding to the experience, Wynn Palace erected a SkyCab gondola (where you can view the show) to circle the lake. 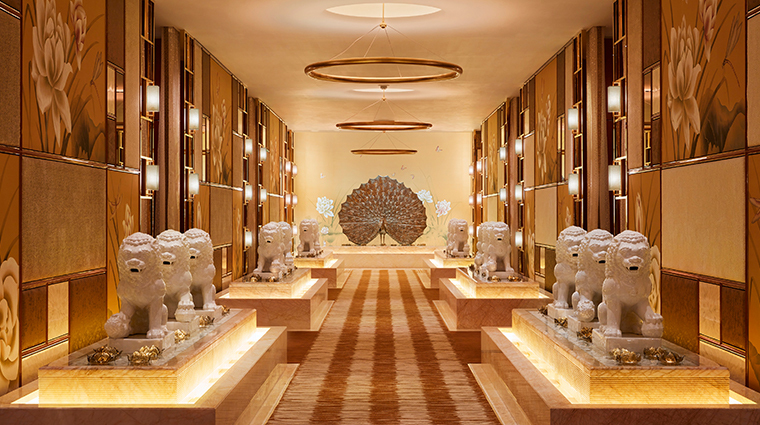 The Macau hotel also doubles as an art gallery, with 18th-century tapestries here and Pop Art sculptures there — a feast for the eyes around every corner. The jewel in the crown is a show-stopping quartet of Buccleuch vases, from the Qing Dynasty, worth about $12.7 million. 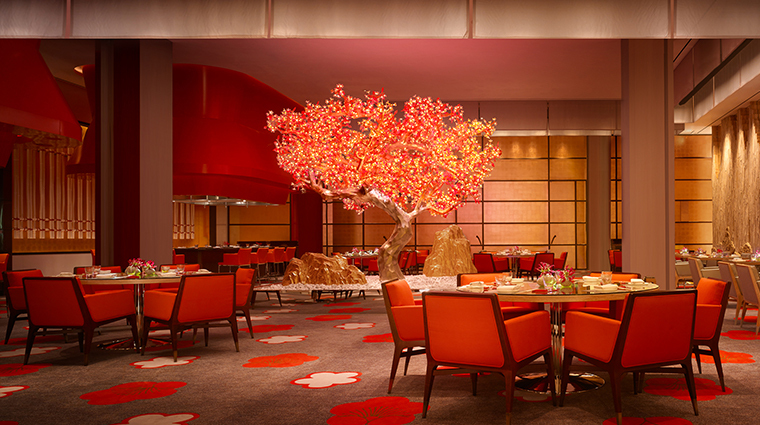 Of course, it wouldn’t be a Wynn resort without an excellent array of culinary experiences. 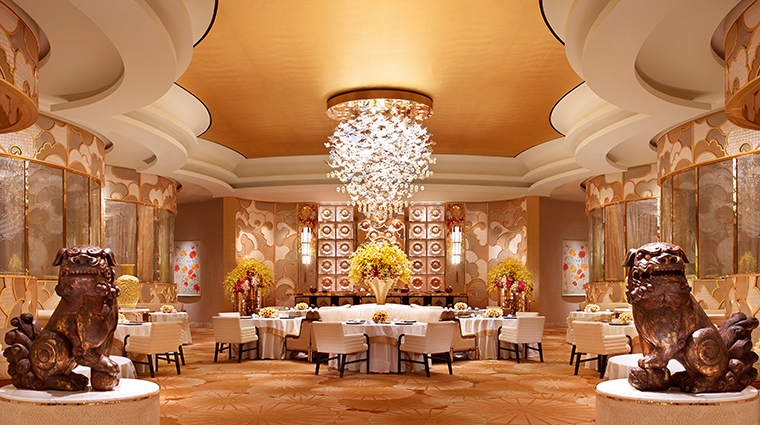 Wynn Palace is home to 11 cafés and restaurants — all with imaginative interior designs that transport you to exotic new worlds. 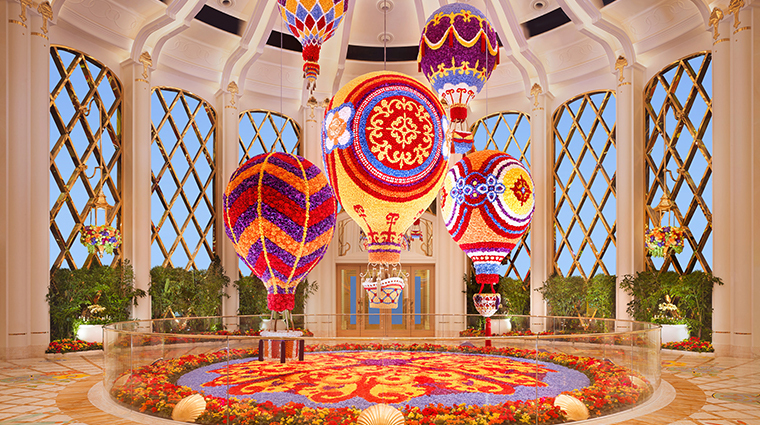 Hundreds of thousands of fresh flowers are required for the seven colorful floral creations scattered about the property. We loved the balloon-like flower bouquet sculpture Tulips. 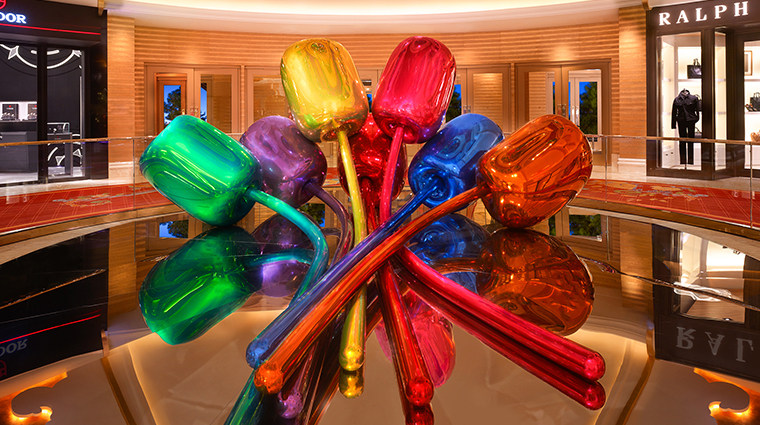 The Pop Art stainless-steel work by American artist Jeff Koons is worth about $33.6 million. Inside Café Fontana, take note of the eclectic chinoiserie-style Viaradot Dragon mirrors, all collected by French artist Gabriel-Frédéric Viardot during his travels. 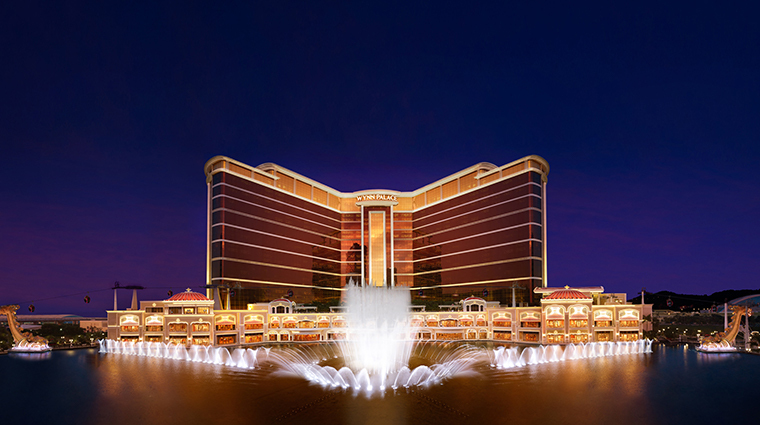 Stretching across 48,403 square feet, Spa at Wynn Palace is the largest in Macau. Head here for royal services, from four-handed massages to honey-milk baths. 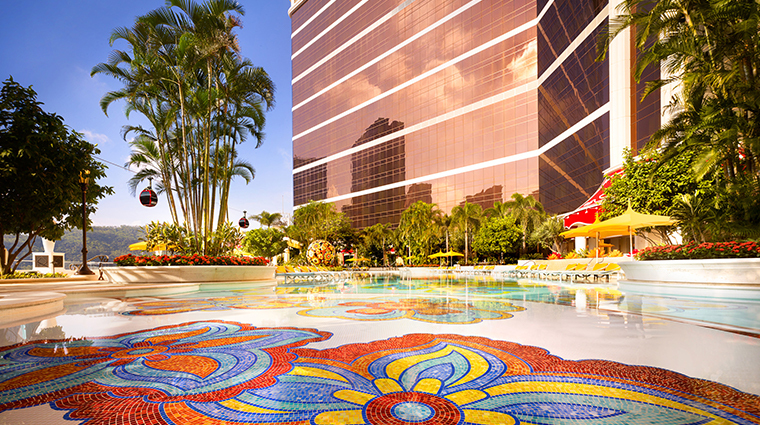 With 52 shops and 200,000 square feet of retail space, the Wynn Esplanade is brimming with big-name brands (Bottega Veneta, Saint Laurent, Hermès) and must-have pieces. With constant construction in Cotai, choose your room carefully. North-facing rooms have the best views, overlooking the Performance Lake. If you enjoyed wearing Wynn’s super absorbent waffle robes, purchase one at The Spa Shop and The Gift Shop. They even come in children’s sizes. 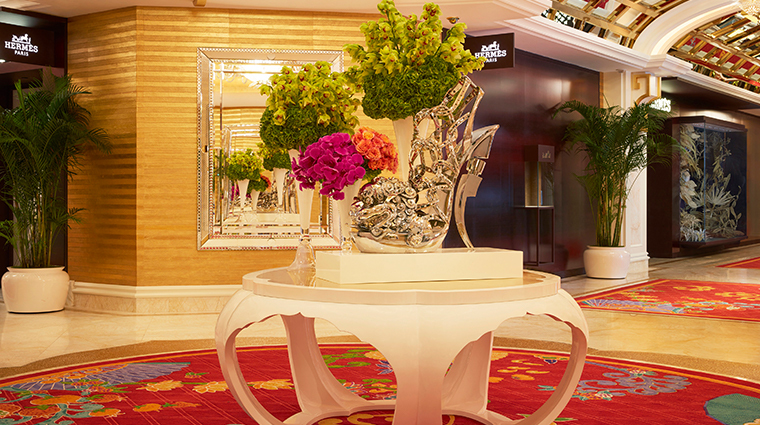 With 1,706 rooms, this is the largest Wynn property to date. 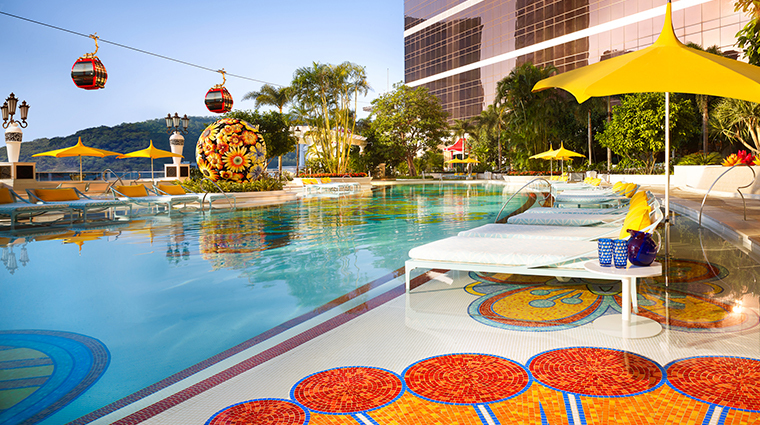 But Wynn Palace doesn’t sacrifice on quality — these luxurious abodes are designed for maximum comfort. Every room includes gold toothbrushes, Bang & Olufsen speakers, 65-inch TVs, Italian marble bathrooms and floor-to-ceiling windows. All rooms feature plush Wynn signature beds and linens, nearly edible “Coco and Tonka Bean” Molton Brown bath amenities and touch-screen room controls that let you close the drapes or dim the lights. 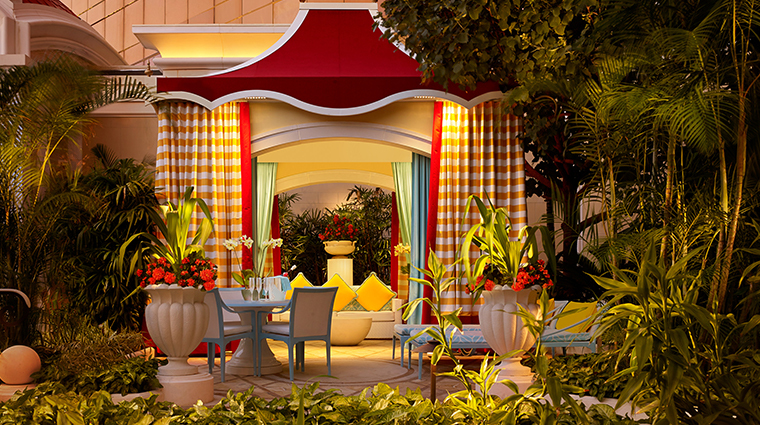 Entry-level Wynn Palace rooms begin at 730 square feet with the largest being the invite-only VIP Garden Villas, measuring in at a massive 8,000 square feet. 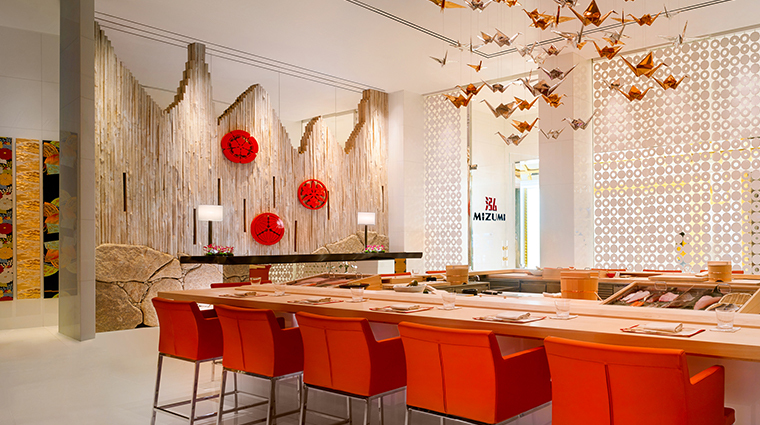 Japanese restaurant Mizumi aims to please with Zen courtyards and an interactive teppanyaki counter. Ask about the extensive Japanese liquor menu, including everything from rare bottles of sake to craft beers and lesser-known whiskies. 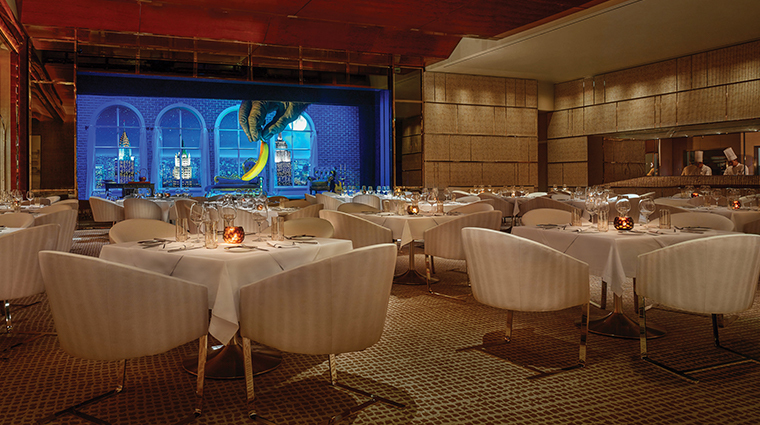 It’s hard to pass up surf ’n’ turf, especially when it’s prepared to perfection at SW, Steve Wynn’s namesake steakhouse. 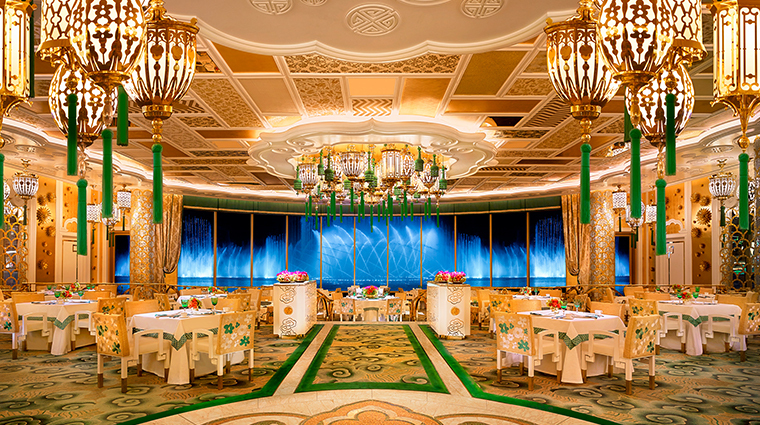 Reminiscent of an opera house, Wing Lei Palace serves Cantonese cuisine in a gilded, three-tiered dining room that overlooks the Performance Lake. When it comes to breakfast buffets, Fontana goes above and beyond normal hotel fare. Set in a palatial chinoiserie-style salon, it includes rows of freshly baked cakes, 10 international stations and front-row seats to the Performance Lake. Dessert gets the royal treatment at Sweets. The hotel patisserie will make your day with cakes, ice cream, pastries and Asian-inspired macaron flavors.